Social network app for doctors around the world. Dr. Kenneth Wallace (MD, Dermatology), a renowned Physician with 25 years of experience, had an idea to develop a mobile app that will help students understand medicine better. Over last 12 years or so he has put together a book that logically arranges organs and diseases. He had approached a couple of independent developers and after spending 3 years and hundreds of thousands of dollars was delivered a data entry website. Dr. Ken did not understand much of mobile and web app technology and was looking for a trusted partner who could design, develop, launch, maintain and market the mobile app which he had named: Notebook of Medicine. Dr. Ken contacted Vaayoo and spoke to one of its Product Manager. After the first meeting, he knew there was a fit. The second meeting was an in-person meeting where Dr. Ken discussed his vision for the app. The Vaayoo PM worked with his UI team to deliver the first draft User Interface designs on how the app would look like and what would be the various workflows. The app was divided into 4 versions to launch an MVP early on, get early market feedback and iterate to add more features. Every version had an clearly defined milestones at which stage Dr. Ken would test the app features. Only once he was satisfied, he would release the payment for that milestone. After feedback from Dr. Ken and updates from the Vaayoo UI design team, the first MVP version was taken for development. It only had the core book component that helped students understand the logic behind medicine and allowed them to take notes on every disease. It was finished and launched on time in July 2017. The Vaayoo team also helped with the data entry of 3.5 million disease records that were required for the book. Early market feedback was good. But the MVP was lacking features to make it to the mass market. The vaayoo team along with Dr. Ken decided to wait until version 2.0 for the spending on Marketing. Version 2.0 had a social sharing component. Along with taking notes, doctors could share disease notes/images/videos with other doctors and get their opinion. The Vaayoo marketing team came up with a "Share because you care" marketing message and created a social media, content and search marketing around this. Notebook of Medicine 2.0 was launched in November 2017 along with the marketing campaign. 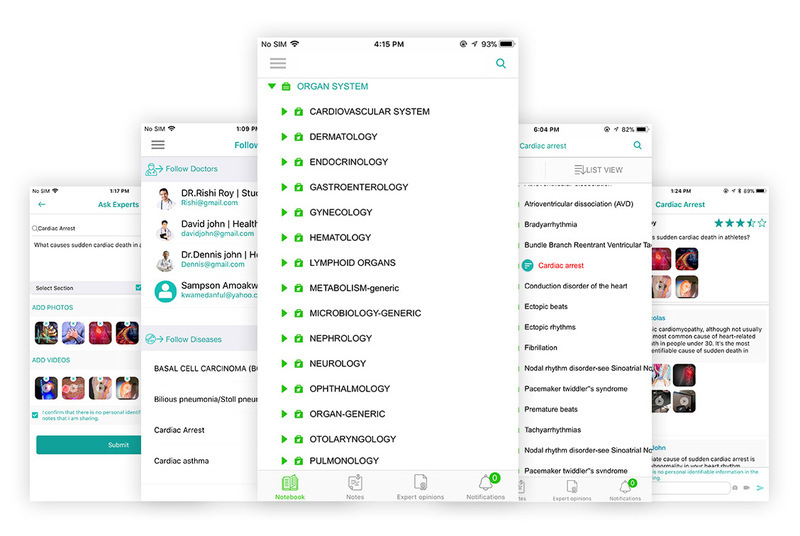 Since the launch, the app and message resonated with doctors around the world. The Notebook Of Medicine 2.0 app signups averaged around 100 per day. To date there are more than 5000 doctors using Notebook of Medicine and sharing everyday. The Notebook of Medicine Facebook page has more than 11000 followers. Throughout the process, the Vaayoo team made sure that the app and the back end was available, the performance was good, the bugs were fixed and new updates were uploaded to the App Store asap. The Vaayoo marketing team kept a pulse on the market and made adjustments to the campaign as required. Vaayoo is now working on Notebook of Medicine version 3.0 which will have group communication features so that doctors can form public and private groups based on their speciality etc. The "Share because you care" campaign continues with a focus on doctor education on how to use the app for content sharing. The app signups continue to increase day by day as more doctors share content. Notebook of Medicine version 3.0 plans to go live around April-May of 2018. A Kid On Track Checklists Is an Easy To Use Mobile App And Ideal For The Caregiver-On-The-Go Who Wants To Track A Child's Development And Identify Potential Delays. Developmental Skills Are Written As Age Specific Checklists. The Activities Help A Child Master These Skills. The Application Is Created By Mrs. Michele Fitzsimmons With Contributions From M. Theresa Bromley. Both Michele And Theresa Have Experience And Deep Understanding of Child Development. Mrs. Fitzsimmons Received A Master's Degree In Teaching Reading And Writing From Manhattanville College. She Has Taught First Grade In Katonah And Harrison, New York. Mrs. Bromley Is Currently A Neonatal Physician Assistant For The Danbury Hospital Newborn Intensive Care Unit In Danbury, Connecticut. In 2010, Michele Went On To Pitch The Concept Of An App Version Of Her Book At The AT&T 'Apps For All' Contest In Las Vegas And Won The Open Category.Michele Says"I Created A Mobile App Because I Was Writing A Book, Checklists For Child Development, And I Entered The Same Idea In AT&T's 'Apps For All' Contest In March 2010. I Won The Open Category And Decided To Build The App Alongside Publishing The Book, Kids On Track Checklists." Winning The Contest Was The Easy Part. When Michele Started Looking For A Company, That Developed Mobile Applications She Did Not Get What She Needed. She Spoke To Quite A Few Developer Companies. Most Of Them Were Quoting Huge Fees And Asking For Longer Delivery Times. None Of Them Were Specialized In Mobile Application Development On Different Variety Of Platforms(iPhone, Android, BlackBerry, J2ME, And WP7). None Of Them Had A Willingness To Help Her In All Aspects Of App- From Concept To Launch. "After Speaking With Developers, I Soon Realized That If I Wanted An App In A Few Months' Time, I Needed A Company Who Specialized In Building And Monitoring Apps. As A New Company I Needed To Find Someone Who Would Accept Installments Of Payments.Vaayoo Was A Good Fit For My Needs. They Have A Design Team And Can Launch On Multiple Platforms, In A Reasonable Timeframe." The Mobile Applications Were Built On Vaayoo's Idea2AppNow Platform Using The Assisted Model Of Development. In This Model, Customers Like Michele, Who Doesn't Have Background In Technology Engage With Vaayoo To Create Mobile Applications. Customers Bring Their Ideas To Vaayoo And Then Vaayoo Takes Care Of Everything Else. The Ideas Are Further Brainstormed And Fleshed Out With The Customer. Vaayoo Then Engages Its Internal Award-Winning User Interface Design Team To Come Up With UI Designs And Workflows. The UI Designs Are Reviewed By Customer. Their Feedback Is Incorporated In The Designs. Once The Designs Are Finalized The App Is Created. If Required, Vaayoo Builds The Server Side Database And Business Logic Too. The App Is Then Given To Customer For Their Testing. Reported Bugs Are Fixed. Vaayoo Then Helps Customer Launch The App By Putting It On All Appropriate App stores Under The Customer's Account. The Proceeds From App Are Directly Collected By Customer. The Customer Pays A Small Monthly Subscription Fee Per App Per OS To Vaayoo Regardless Of Number Of Users Or Revenues That They Make. For A New Startup Which Always Has Limited Resources But Cannot Afford To Go Late To The Market This Is A Great Advantage.Michele Says "Vaayoo Accepts A Monthly Subscription With A Buyout Option, Giving Their Clients Time To Build Revenue.Vaayoo Worked Hard And Brought My App, Kids On Track Checklists, To The Blackberry Market In A Few Months' Time. They Have Worked Around The Clock To Address Issues In The Beta Launch Phase. Soon, I Will Be Launching On The iPhone. "Vaayoo's Monthly Subscription Costs Also Includes Maintenance, Bug Fixes And Feature Additions To The App. Very Important For A New App Since There Is Always A Need To Add Or Modify Features Based On The User Feedback. After The User Interface Was Finalized, Vaayoo Took Just 4 Weeks To Finish The App And Release It For Testing. Vaayoo Could Do It Because Of The Idea2Appnow Platform That It Has Created And Patented Over The Years. This Platform Allows Non-Technical Users To Create Mobile Applications By Just Doing Drag And Drop And Without Writing A Single Line Of Code. Time To Market Is Tomorrow And Costs Are Negligible. The App, Now In Its Beta Period Has Been A Tremendous Success On BlackBerry App World With Average Of 800 Downloads Per Day. iPhone And Android Are Currently Being Tested Internally And Will Be Launched Soon. Michele Overwhelmingly Recommends Vaayoo, "At This Early Stage, I Can Say That I Recommend Vaayoo To Anyone With A Good App Idea. They Have The Technical Knowledge To Build, Debug And Upgrade Phone Applications. They Have A Reasonable Payment Plan And They Cater To Their Clients. The People At Vaayoo Have Stayed In Close Contact With Me During This Process And Have Been Flexible In Making Adjustments To The App Based On My Vision. They Are Professional, And A Pleasure To Work With."